Fiberglass pools are the number one choice for North American pool owners, across the board. Fiberglass pools are also the most popular choice. Fiberglass Pools also offer more benefits than concrete and vinyl swimming pools. When it comes to choosing a swimming pool for your home, it is important to know your options. Let’s take a closer look at why a fiberglass swimming pool is a better choice than a concrete one. Less Expensive — Although there isn’t much difference between fiberglass and concrete swimming pools initially, a fiberglass pool pays for itself over time. This is due to the fact that fiberglass pools require less maintenance, chemicals, and resurfacing. Quicker Installation — Fiberglass pools –from start to finish, including decking — take less than a month to install. That means less time spent with annoyed neighbours, stressed out pets, heavy machinery, and an uprooted backyard. More Structurally Sound — Fiberglass pools are the most compatible structure for whatever your swimming pool surroundings have in store. Regardless of soil conditions and elements, your fiberglass pool will shrink or swell flexibly, without fail. More “Green” — Fiberglass pools are quite possibly the most environmentally friendly swimming pool option on the basis that it uses less chemicals. This factor does not only save your wallet, but it saves the environment too! Less Maintenance — Fiberglass pools have been engineered to require less maintenance. This means that you can spend more time enjoying your swimming pool, as opposed to taking care of it. Fiberglass pools only require about a half hour of your time to care for it, each week. Much Harder for Algae to Grow — On that note, let’s take a look at the fact that algae, also known as the number one menace to pool owners everywhere, will not be a problem. This is because your fiberglass pool features a non-porous surface. Salt Water Compatible — Although running a salt water operation with your swimming pool can cause build up on pool surfaces creating the need to resurface much sooner, a fiberglass swimming pool surface does not react to salt water. Seating Included — Fiberglass pool shells include built-in bench steps. This saves on having to install this popular add-on later on down the road. Better on Bare Feet — Concrete pools offer a rough, gritty surface that can hurt the swimmer’s feet. Fiberglass pools offer a much smoother surface, which allow swimmer to play in the pool care-free. Added Real Estate Appeal — Fiberglass pools are low maintenance, easy to install, and don’t require a lot of extra work in the future, whereas concrete and vinyl do. This is an attractive quality to any potential homebuyer. 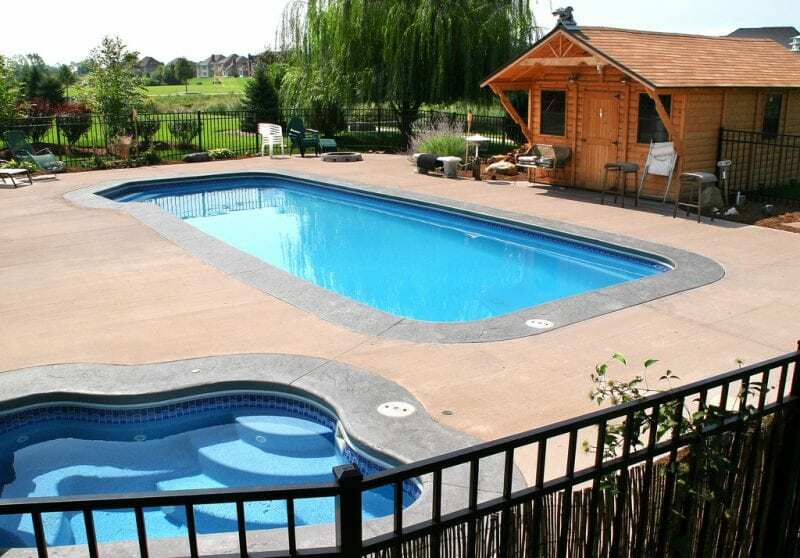 Overall, you can see that there really is no question on what type of pool is best for your home, it is a matter of which shape of fiberglass shell will fit your home. Since a fiberglass pool Is a better choice than a concrete pool, contact Elitepools.ca today for more details on how to select the fiberglass pool that is right for you. We are Ontario’s leader in fiberglass pool installations, installing hundreds of pools across Ontario each year.